Brooklyn is a small riverside settlement occupying the narrow strip of land between the river's southern bank and the extensive and attractive bushland to the south (Ku-Ring-Gai Chase National Park) and west (Muogamarra Nature Reserve). Just offshore, running parallel to Brooklyn's east-west span and equally narrow, is Long Island, a nature reserve, and off Flat Rock Pt, at Brooklyn's north-eastern tip, is Dangar Island, which, although much shorter than Long Island, has a jetty, wharf, post office, general store, some roads and a reserve where there are some Aboriginal rock carvings. This scenic and very pleasant spot is 47 km north of Sydney via the Newcastle Freeway (the exit ramp is on the northern side of the bridge). Virtually all of Brooklyn is located along Brooklyn Rd which heads off the Pacific Highway just before Peats Ferry Bridge and runs westwards alongside the riverbank out to Flat Rock Pt. If you turn into Brooklyn Rd then, to the immediate left, is Dolphins Boatshed Marina with a boat ramp and a picturesque flotilla offshore. Just past it is a large roadside sign with a map of Brooklyn outlining where to find the main businesses. 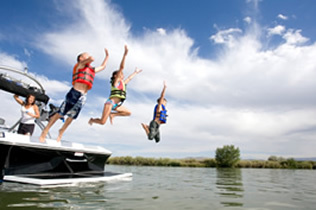 Boating is the major drawcard. 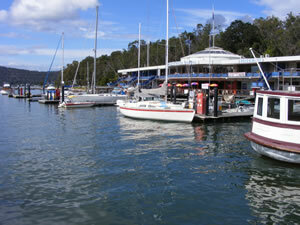 There are houseboats, hire boats, ferries, water taxis, boat ramps and marinas. Governor Phillip and party entered Broken Bay in a whaleboat as early as March 1788. They sailed past the mouth of Brisbane Water. Apparently the indigenous peoples were impressed with the fact that he had a missing front tooth, as it was an initiation rite amongst them to knock out the front tooth of young men. 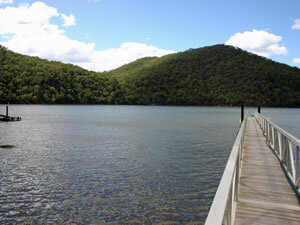 The party camped on Dangar Island, which Phillip named Mullet Island after making a substantial catch offshore. George Peat was the first European settler, receiving a land grant in 1836 at what is now known as Peats Bight. As he resided in Sydney he hacked out a track from Pennant Hills to the river which was used as the basis for a road to the north in 1847. A punt forded the river from Peats Bight to present-day Mooney Mooney, hence the name Peats Ferry Bridge. The railway arrived in 1877, making it less than an hour's journey from Hornsby. A ferry service then conveyed passengers to Gosford. Brooklyn was created in 1884 when the Fagan Brothers subdivided their 100-acre grant. The township was apparently named after a town in Holland called Breucklen. America's Union Bridge Company built the first railway bridge across the Hawkesbury in 1889. Oyster farming subsequently became a major feature of the local economy and the Hawkesbury area today supplies 10 per cent of NSW's oysters. By the early twentieth century the Hawkesbury had become a major destination of holiday-making Sydneysiders and Brooklyn soon became heavily reliant on the tourism industry. 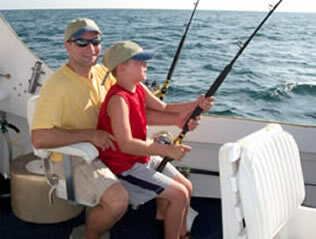 Visitors travelled upriver in fishing boats armed with fishing rods and prawn bait. This led to the development of the prawning industry, particularly as it was outlawed in Brisbane Water.